Despite some recent improvements in the economy, the twin deficits– balance of payments and fiscal deficits– continue to be serious concerns. The reductions of both these deficits are of paramount importance for the country’s economic stability and growth. The country’s external financial vulnerability arises out of the heavy debt servicing costs of the massive foreign debt. The prospect of reducing the fiscal deficit is in doubt owing to the inability to raise adequate revenue. The weakness in the balance of payments arises owing to the need to meet debt serving obligations of around US$ 4 billion this year. Although the current account of the balance of payments (trade account and services income) is likely to generate a surplus, the capital outflows and debt servicing payments have placed the external finances in a vulnerable position. The likely surplus in the current account of the balance of payments this year is inadequate to meet the debt servicing obligations. Consequently there is a need for fresh borrowing to meet debt servicing obligations. The recent borrowing of US$ 1.5 billion, the IMF’s EFF facility of US$ 1.5 billion (of which only the first instalment of US$ 0.5 billion has been given) and earlier borrowing were needed to meet this situation. The external reserves of about 3-4 months are not at a comfortable level. Owing to the additional borrowing foreign debt is likely to increase this year. The current account of the balance of payments that includes the trade and services account has improved in the first few months of the year. A lower trade deficit, higher worker’s remittances, increased tourist earnings and earnings from other services such as ICT are expected to more than wipe out the trade deficit and leave a surplus. These improvements are expected to continue during the rest of the year to yield a surplus in the current account. Yet this current account surplus would be inadequate to meet the debt servicing costs of about US$ 4 billion during the course of the year. Therefore the government has resorted to fresh heavy foreign borrowing to meet the debt servicing obligations. At the end of 2015 the foreign debt had risen to US$ 44.8 billion and debt servicing payments had risen sharply to absorb 27 per cent of export earnings. Hence the need for further borrowing in 2016 to meet debt servicing obligations and costs of development projects. The further borrowing in 2016 will increase foreign indebtedness and increase debt servicing costs in the coming years. Improvements in the balance of payments are needed to reduce this external vulnerability. Despite the poor export performance this year too, the trade deficit has been reduced somewhat by decreased imports. The trade deficit in the first quarter of the year was reduced slightly by 2.2 per cent compared to the first quarter of last year. If the current trend of decreased imports continues and export earnings increase owing to the resumption of fish exports to the EU and the growth in garments exports gain momentum, it may be possible to contain the trade deficit to about US$ 7.5 billion, a fall from the trade deficits of over US$ 8 billion in 2014 and 2015. Such a reduction in the trade deficit is essential owing to the severe balance of payments difficulties the country is facing. The services account of the balance of payments that consists of workers’ remittances, earnings from tourism, earnings from information and communication (ICT) services and earnings from other services has shown a commendable growth. In 2016 the increase in tourist earnings and remittance and other service earnings would wipe out the trade deficit to yield a balance of payments surplus. 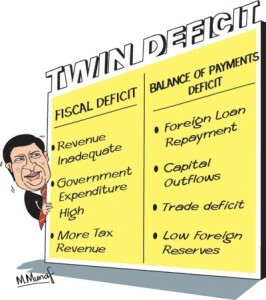 However capital outflows from government securities and the Colombo Stock Market have eroded this current account deficit and the large debt servicing payments have made the external finances and the balance of payments very vulnerable. The large fiscal deficit has serious repercussions on the economy. The economy would be unstable without fiscal consolidation. Although tax revenues have improved in the first quarter of this year, the current controversy and changes in taxes have created doubts that the fiscal deficit target would be achieved this year. In the event that the expected tax revenues cannot be gathered owing to changes in VAT and other proposed taxes, there is a need to introduce other effective taxes to yield adequate revenue to ensure the fiscal deficit target of 5.4 per cent of GDP is achieved in 2016. It is crucial that a taxation system that increases government revenue to about 15-17 per cent of GDP is implemented to bring down the fiscal deficit to 3.5 per cent of GDP in 2020. Bringing down the fiscal deficit is vital for the resolution of the country’s fundamental economic problems. While there has been an acknowledgement of this, the fiscal discipline required to achieve this is difficult in the current political context and milieu. However there has been significant progress on the expenditure side where current expenditure has been brought down as a percentage of GDP. Hopefully there would be no overruns in public expenditure and supplementary estimates. The country’s economic stability is threatened by the large twin deficits that must be contained. Reducing the balance of payments and fiscal deficits are essential for economic stability. Global conditions and the repayment obligations of the accumulated debt are two components of the balance of payments that are outside the control of the country. Therefore imports must be kept in check with appropriate fiscal and monetary policies, while at the same time adopting policies that would encourage exports. The achievement of fiscal deficit targets by both containing government expenditure and putting in place effective taxation measures are vital. The reduction of the fiscal deficit is vital to stabilise the economy.